A study was undertaken to resolve preliminary conflicting results on the proliferation of leukemia cells observed with different c-myc antisense oligonucleotides. RNase H-active, chimeric methylphosphonodiester / phosphodiester antisense oligodeoxynucleotides targeting bases 1147–1166 of c-myc mRNA downregulated c-Myc protein and induced apoptosis and cell cycle arrest respectively in cultures of MOLT-4 and KYO1 human leukemia cells. In contrast, an RNase H-inactive, morpholino antisense oligonucleotide analogue 28-mer, simultaneously targeting the exon 2 splice acceptor site and initiation codon, reduced c-Myc protein to barely detectable levels but did not affect cell proliferation in these or other leukemia lines. The RNase H-active oligodeoxynucleotide 20-mers contained the phosphodiester linked motif CGTTG, which as an apoptosis inducing CpG oligodeoxynucleotide 5-mer of sequence type CGNNN (N = A, G, C, or T) had potent activity against MOLT-4 cells. The 5-mer mimicked the antiproliferative effects of the 20-mer in the absence of any antisense activity against c-myc mRNA, while the latter still reduced expression of c-myc in a subline of MOLT-4 cells that had been selected for resistance to CGTTA, but in this case the oligodeoxynucleotide failed to induce apoptosis or cell cycle arrest. We conclude that the biological activity of the chimeric c-myc antisense 20-mers resulted from a non-antisense mechanism related to the CGTTG motif contained within the sequence, and not through downregulation of c-myc. Although the oncogene may have been implicated in the etiology of the original leukemias, expression of c-myc is apparently no longer required to sustain continuous cell proliferation in these culture lines. The v-myc gene was originally discovered as being the cell transforming oncogene of the avian myelocytomatosis virus MC29, and was subsequently shown to be a virally sequestered copy of a member of a normal cellular gene family . The c-myc gene was subsequently found to be overexpressed in a variety of human malignancies, most notably in Burkitt lymphoma, through chromosomal translocations into the transcriptionally active immunoglobulin loci [2, 3], and in other cancers through gene amplification [2, 4, 5]. The gene product has been shown to act as a transcription factor and has been implicated in cell cycle control, while overexpression can contribute to malignant transformation or result in induction of programmed cell death [for detailed reviews see [6–9]]. Results of experiments with an antisense oligodeoxynucleotide sequence targeting the initiation codon region of c-myc mRNA (bases 559–573 HSMYC1, GenBank Accession Number V00568) [8, 10, 11] have been taken as providing strong support for the generally accepted view that expression of the gene is required for passage of cells from G1 into S phase of the cell cycle . In consideration of the foregoing, it was somewhat of a surprise to us to find that we could reduce expression of c-myc to low levels for several hours, following intracytoplasmic delivery of the same antisense sequence through reversible plasma membrane permeabilization with streptolysin O, but that such treatment had no effect on the proliferation of cells of the human T lymphocytic leukemia line, MOLT-4 . The oligodeoxynucleotide 15-mer used in these experiments had a chimeric structure composed of 3 nuclease-resistant methylphosphonate internucleoside linkages at each end of the molecule to protect against exonucleolytic degradation, and a central section with 8 normal phosphodiester groups to elicit cleavage of c-myc mRNA by endogenous cellular RNase H. In view of the transient nature of the suppression of c-myc gene expression, due to the intracellular decay of intact antisense effector , attempts were made to enhance the biological stability of the antisense oligodeoxynucleotide, by reducing endonuclease susceptibility through further methylphosphonate substitution. However, these experiments served to demonstrate that the initiation codon region of c-myc mRNA, which we refer to as the A site, is involved in secondary structure and is not a good target for antisense attack . The methylphosphonate modification is helix destabilising [14, 15] and just one further substitution abolished RNase H-mediated antisense activity at the initiation codon site , while reduced phosphodiester structures targeting apparently accessible regions in other mRNAs were still highly active . On the other hand, the downstream region bounded by positions 1150–1159 of c-myc mRNA was obviously readily accessible since it was efficiently cleaved by RNase H in the presence of the initiation codon antisense oligodeoxynucleotide , through only partial complementarity to the latter over the sequence CGTTGAGG*GG within the oligomer (G* ignifies a GU base pair in the hybrid between the A site antisense oligodeoxynucleotide and positions 1150–1159 of c-myc mRNA). Chimeric methylphosphonate / phosphodiester oligodeoxynucleotides fully complementary to positions 1147–1166 of c-myc mRNA, which we refer to as the D site, and incorporating the sequence CGTTG within the central phosphodiester section were shown to be highly effective at ablating the message by an RNase H dependent mechanism, as evidenced by the appearance of c-myc mRNA fragments on Northern blots, and at reducing c-Myc protein to low levels over 24 h in living leukaemia cells . These effects were accompanied by marked inhibition of cell proliferation that was initially ascribed to the sustained downregulation of c-myc achieved through targeting the new D site. However, this interpretation was put in doubt when prolonged suppression of c-myc gene expression, achieved with a morpholino antisense oligonucleotide analogue 28-mer, simultaneously targeting the exon 2 splice acceptor site and initiation codon , failed to affect cell proliferation. During the course of the above work we had also undertaken an investigation into the observation that a random sequence, control 15-mer oligodeoxynucleotide rapidly induced apoptosis following intracytoplasmic delivery into MOLT-4 and Jurkat E6 human T lymphocytic leukemia cells. The results of this study demonstrated that the activity was due to the phosphodiester linked 5-mer motif CGGTA present within the oligodeoxynucleotide, and that isolated, end-protected CpG 5-mers of sequence type CGNNN (N = A,G,C or T) induced apoptosis with varying degrees of potency depending upon the nature of the 3' terminal sequence . The more active 5-mers were also found to induce cell cycle arrest without triggering apoptosis in a number of other leukemia cell lines. The 5-mer sequence CGTTG, present within both the A site, initiation codon c-myc antisense oligodeoxynucleotide and the D site antisense effector, was one of the most potent inducers of apoptosis / cell cycle arrest. Why the A site antisense oligodeoxynucleotide failed to induce apoptosis in MOLT-4 cells is readily explained by the fact that the internucleoside methylphosphonate substitution of the chimeric structure extended into the CpG 5-mer motif , which was shown to abolish apoptosis inducing activity of CpG oligodeoxynucleotides . On the other hand the D site antisense oligodeoxynucleotides contained CGTTG in fully phosphodiester linked form  raising the possibility that the observed antiproliferative effects were related to the non-antisense biological activity of this motif rather than to the antisense-induced downregulation of c-myc expression. The situation is further complicated by the observation that the sequences CGGTA and CGTTA, present within 15-mer oligodeoxynucleotides and as an isolated 5-mer respectively, induced quite substantial reductions in the levels of c-Myc protein expression in MOLT-4 and myeloid leukemia KYO1 cells by a non-antisense mechanism, with lesser effects on the corresponding intracellular concentrations of c-myc mRNA . The present work was undertaken to establish the relevance of c-myc expression to cell proliferation in human leukemia cell lines as opposed to CpG 5-mer effects. Our results demonstrate that c-Myc protein may be severely reduced in cells without affecting proliferation, suggesting that if dysregulation of c-myc was involved in the etiology of the source leukemias, its function has since been superseded by other factors which maintain the cells in a permanently proliferative state. A range of chimeric methylphosphonodiester / phosphodiester antisense oligodeoxynucleotides (Table 1) targeting bases 1147–1166 of human c-myc mRNA (HSMYC1, GenBank Accession Number V00568), derived from exon 2 and corresponding to codons 197–203 (part) of c-Myc protein, were evaluated for their effects on c-myc gene expression following intracytoplasmic delivery into cells of the human chronic myeloid leukemia line, KYO1. Molecules with stepwise reductions in the number of central phosphodiester linkages from 9 to 4 exhibited high activity in inducing the ablation of c-myc mRNA. Since c-Myc protein has a very short half-life , its intracellular concentration reflected the reductions in the level of the mRNA (Figure 1A). Control oligodeoxynucleotides with an inverted antisense or sense sequence had no significant effect on c-myc gene expression. Ablation of c-myc mRNA by the antisense oligodeoxynucleotides resulted from an RNase H-mediated mechanism directed by the central phosphodiester section of the molecules. RNase H-generated fragments of c-myc mRNA were visible on Northern blots of total RNA isolated from treated KYO1 cells at 4 h, and essentially the same results were observed whether intracytoplasmic delivery was achieved by reversible plasma membrane permeabilization with streptolysin O or by electroporation (Figure 1B). Figure 2A presents the dose response for ablation of c-myc mRNA in cells loaded by streptolysin O permeabilization from the indicated external concentrations of a chimeric antisense oligodeoxynucleotide 20-mer containing just 5 central phosphodiester linkages. 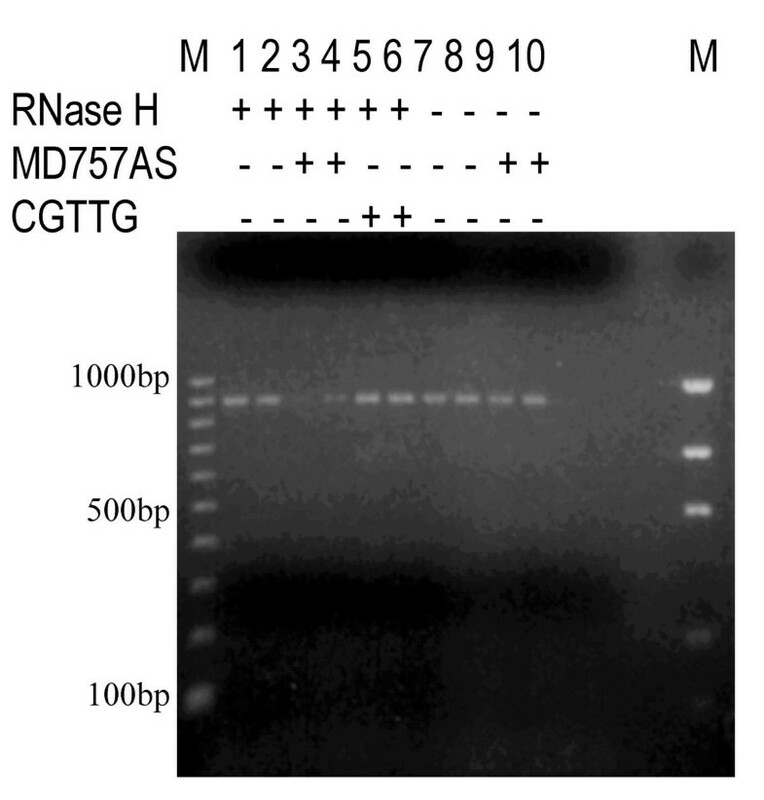 GAPDH mRNA was included as a control for specificity in this experiment since it had previously been shown to be susceptible to RNase H-mediated cleavage at high concentrations of c-myc D site antisense oligodeoxynucleotides , through partial complementarity over 9 consecutive bases from 967–975 (HSGAPDR, GenBank Accession Number X01677) and 11 overall between 961–980. It can be seen that cells became arrested in the cell cycle (Figure 2B) at concentrations of oligodeoxynucleotide which had significant effects on c-myc mRNA and negligible effects on GAPDH mRNA (Figure 2A). The effects of an RNase H-active, chimeric methylphosphonodiester / phosphodiester antisense oligodeoxynucleotide on c-myc mRNA and c-Myc protein in KYO1 cells. (A) Relative levels of mRNA and protein at 4 h post intracytoplasmic delivery by streptolysin O permeabilization were determined by densitometry of Northern and Western blots. Data represent the mean and standard deviation of 3 replicates. The structures of the antisense oligodeoxynucleotide, and inverted antisense and sense controls are given in Table 1. (B) Northern blots of c-myc mRNA at 4 h following oligodeoxynucleotide delivery by streptolysin O permeabilization and by electroporation of KYO1 cells. Grey arrow; full length mRNA. Black arrows; RNase H-generated 5' fragments of mRNA. Dose-response for ablation of c-myc mRNA and inhibition of proliferation of KYO1 cells by a chimeric methylphosphonodiester / phosphodiester antisense oligodeoxynucleotide. Cells were loaded by streptolysin permeabilization from the indicated external concentrations of oligodeoxynucleotide 5'F-MD757AS (Table 1). (A) Relative levels of c-myc and GAPDH mRNA at 4 h. Mean and standard deviation of 3 replicates. (B) Increase in cell number / ml over 20 h from an initial cell density of 5 × 105 / ml. Mean and standard deviation of 3 replicates. In contrast to the foregoing, an RNase H-inactive morpholino c-myc antisense oligonucleotide 28-mer, simultaneously targeting both the initiation codon and exon 2 splice acceptor sites of c-myc (Table 1), inhibited both splicing and normal translation initiation, induced missplicing to a cryptic site 44 nucleotides downstream of the normal splice acceptor site thereby cutting out the AUG initiation codon, and after around 4 h of inhibition, began to induce translation initiation from a downstream, in frame AUG . However, despite the almost complete ablation of full length c-Myc protein over 24 h and negligible level of truncated product at 4 h (Figure 3A), KYO1 cells continued to proliferate at the same rate as cells permeabilized in the absence of oligonucleotide or in the presence of sense and nonsense controls (Figure 3B). Similar results were observed with HL60 human acute promyelocytic leukemia, U937 human histiocytic leukemia and MOLT-4 human T lymphocytic leukemia cells (data not shown). Effects of an RNase H-inactive morpholino antisense oligonucleotide on c-myc mRNA, c-Myc protein, and proliferation of KYO1 cells. The antisense, and control sense and nonsense oligonucleotides (Table 1) were delivered into cells by streptolysin O permeabilization from an external concentration of 20 μM. (A) Upper panels; Northern blots of mRNA at 4 and 24 h. Lower panels; Western blots of c-Myc protein at 4 and 24 h. The 47 kDa truncated protein containing the c-Myc epitope recognised by the antibody mix resulted from initiation of translation at an in-frame AUG 300 bases downstream of the c-Myc 2 AUG initiation codon . (B) Cell number relative to that at 2 h after loading cells with oligonucleotide. Values are the mean and standard deviation of 3 replicates. The CpG motif, CGTTG, present within the central phosphodiester section of the chimeric methylphosphonodiester / phosphodiester, c-myc antisense 20-mer, 5'F-MD757AS (Table 1), also inhibited the proliferation of KYO1 cells when delivered as an isolated 5-mer which was end-protected against exonuclease degradation by fluorescein at the 5' end and 3-hydroxypropyl phosphate at the 3' end (Figure 4A). In contrast to the large reduction in c-myc mRNA and appearance of RNase H-generated fragments at 30 min in cells treated with the full length antisense 20-mer, CGTTG induced only a modest drop in mRNA and no fragments were detectable on Northern blots (Figure 4B). However, CGTTG treatment did downregulate c-Myc protein, although this occurred more slowly and to a somewhat lesser extent than in cells loaded with the full length antisense 20-mer (Figure 4C). Modest reductions in c-myc mRNA and more profound decreases in c-Myc protein were previously observed in KYO1 and MOLT-4 cells treated with other CpG oligodeoxynucleotides . Therefore, it was unlikely that downregulation of c-Myc protein by CGTTG occurred through an antisense mechanism. Indeed, unlike the c-myc antisense 20-mer, CGTTG did not promote cleavage of c-myc mRNA by E. coli RNase H, as determined by incubation in vitro with total RNA isolated from KYO1 cells, followed by RT-PCR using c-myc specific primers across the antisense target site (Figure 5). Both the c-myc antisense 20-mer, 5'F-MD757AS and CGTTG rapidly induced apoptosis in MOLT-4 cells and downregulation of c-Myc protein was maintained over 4 h by both treatments (Figure 6A and 6B). 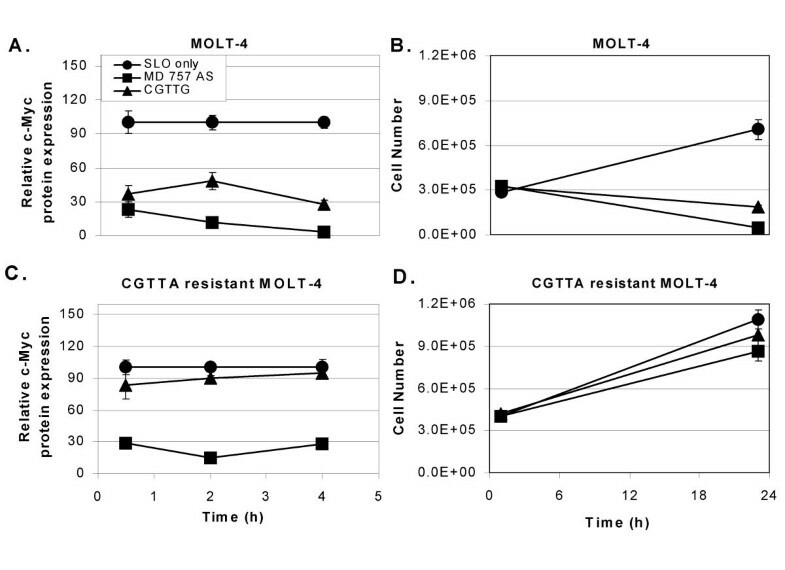 However, a MOLT-4 cell subline generated for resistance to CpG 5-mers by repetitive treatments of surviving cells with CGTTA was also resistant to the apoptogenic action of CGTTG and the c-myc antisense 20-mer (Figure 6D). CGTTG also failed to induce a significant effect on c-Myc protein expression in this MOLT-4 subline (Figure 6C). Nevertheless, the true RNase H-mediated antisense activity of 5'F'MD757AS against c-myc mRNA was maintained and c-Myc protein levels were severely reduced in CpG oligodeoxynucleotide-resistant cells loaded with the 20-mer (Figure 6C), but the cells did not apoptose (Figure 6D). Consequently, it is clear that once the propensity for CpG oligodeoxynucleotide-induced apoptosis is removed, the previously observed correlation between downregulation of c-Myc protein and cell death no longer holds. Comparison of the chimeric c-myc antisense 20-mer, 5'F-MD757AS (Table 1) with the CpG 5-mer motif CGTTG contained within its phosphodiester section for effects on c-myc mRNA, c-Myc protein and proliferation of KYO1 cells. Cells were loaded with oligodeoxynucleotide by streptolysin O permeabilization from an external concentration of 20 μM. 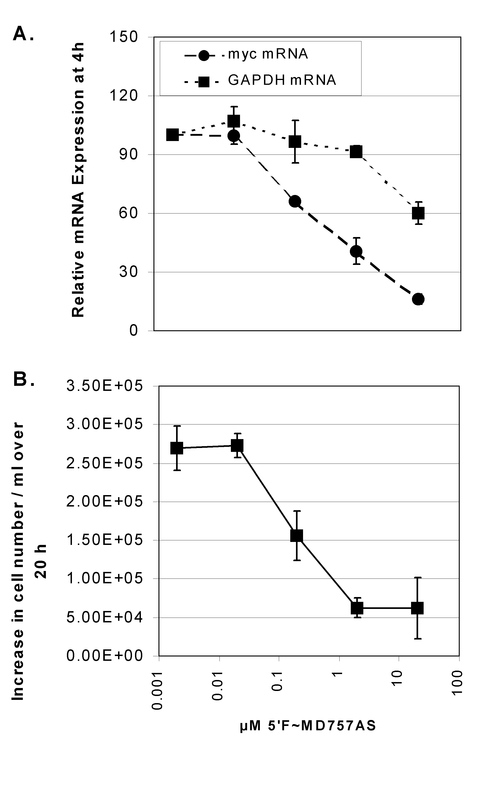 (A) Cell proliferation over 24 h. (B) Levels of full length c-myc mRNA 30 min after oligodeoxynucleotide delivery. RNase H-generated mRNA fragments were visible on the Northern blot for cells treated with the 20-mer but not the 5-mer. (C) Relative levels of c-Myc protein. Values in all panels are the mean and standard deviation of 3 replicates. Assay in vitro for oligodeoxynucleotide activity with E. coli RNase H against c-myc mRNA in total RNA isolated from KYO1 cells. Reaction mixtures containing 1 μg RNA and 0.5 U RNase H in 18 μl were incubated at 37°C for 30 min in the presence, where indicated, of 22 μM oligodeoxynucleotide. Following RT-PCR with c-myc-specific primers straddling the antisense target site, products were separated by 1.5% agarose / ethidium bromide gel electrophoresis and viewed under UV light. M, markers. The expected product size from uncleaved mRNA is 899 bp. Lane 11 was loaded with a no oligodeoxynucleotide, no reverse transcriptase control. Only lanes 3 and 4 loaded with 20-mer antisense replicates showed reductions in signal intensity consistent with significant RNase H-mediated cleavage of c-myc mRNA. Comparison of the chimeric c-myc antisense 20-mer, 5'F-MD757AS with its CpG motif as an isolated 5-mer oligodeoxynucleotide for effects on c-Myc protein levels and induction of apoptosis in MOLT-4 cells and a MOLT-4 CpG 5-mer-resistant subline. (A) The antisense 20-mer reduced intracellular concentrations of c-Myc protein in MOLT-4 cells more effectively than the 5-mer. (B) Both oligodeoxynucleotides induced apoptosis in parental MOLT-4 cells. (C) The antisense 20-mer also reduced the level of c-Myc protein in the MOLT-4 subline selected for resistance to CGTTA whereas the 5-mer had no significant effect. (D) Neither oligodeoxynucleotide induced apoptosis or cell cycle arrest in the CpG 5-mer-resistant subline. Viable cell number was determined by flow cytometric counting of cells excluding propidium iodide. Values in all panels are the mean and standard deviation of 3 replicates. In applying antisense oligonucleotides to dissect gene function it is desirable to use two types of molecule embodying different mechanisms of action against the target mRNA. It is unlikely that non-specific or unanticipated sequence-specific biological activity will be the same when the chemical structure of the oligonucleotides and the strategy for blocking translation of the message are widely different. Therefore, the assignment of gene function can be made with greater confidence when phenotypic effects of different types of antisense oligonucleotide concur. We have targeted expression of the c-myc gene in human leukemia cell lines using two different antisense strategies. On the one hand, cleavage of c-myc mRNA within the translated region by endogenous RNase H was induced through application of chimeric methylphosphonodiester / phosphodiester oligodeoxynucleotides. 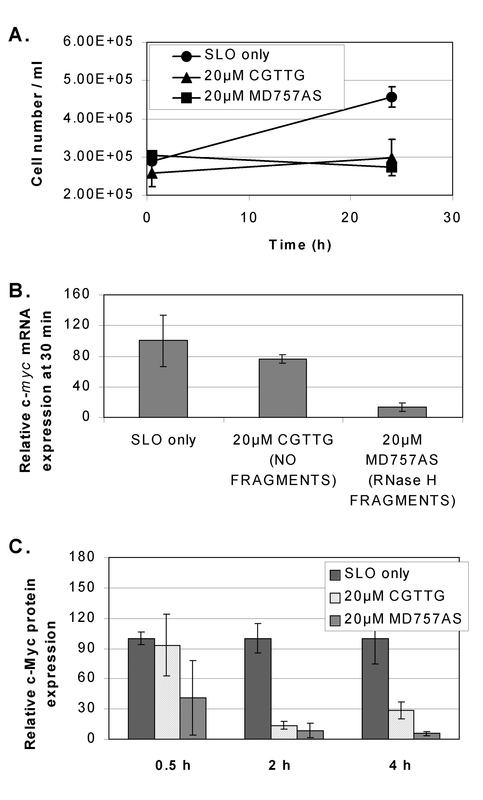 On the other, c-Myc protein was downregulated through steric blockade of both pre-mRNA splicing and translation initiation using a morpholino oligonucleotide analogue. In both cases the data presented and reported previously [19, 21] support the conclusion that the anticipated mechanisms were entrained within the cells and that true antisense effects on c-myc gene expression were achieved. However, in our case the phenotypic effects in terms of cell proliferation were contradictory. The induction of apoptosis in MOLT-4 cells and cell cycle arrest in KYO1 cultures by RNase H-active chimeric oligodeoxynucleotides targeting bases 1147–1166 of c-myc mRNA were seemingly predictable results. The lack of effect of the morpholino antisense oligonucleotide on leukemia cell proliferation was somewhat surprising, especially considering that ablation of c-Myc protein at 4h was almost total (Figure 3). The accumulation of a protein of approximately 47 kDa carrying the c-Myc epitope recognised by the antibody mix, clearly visible at 24 h, was the result of initiation of translation at an in-frame AUG exactly 300 bases downstream of the position of the normal AUG initiation codon in c-myc mRNA. Such c-Myc short proteins which lack most of the N-terminal transactivation domain but retain the C-terminal protein dimerization and DNA binding domains have been observed in certain cells under normal growth conditions . They are unable to activate transcription and inhibit transactivation by full-length c-Myc protein. However, in the present experiments both the full-length protein and the truncated product were barely detectable at 4 h after the initiation of antisense treatment (Figure 3), but despite their absence the cells continued to proliferate at the same rate as untreated controls. In view of the foregoing it seemed likely that the biological activity of the RNase H-active antisense oligodeoxynucleotides was due to the action of the CGTTG motif present within the phosphodiester section of the chimeric molecules, rather than to downregulation of c-Myc protein. Apoptosis induced by CpG oligodeoxynucleotide 5-mers in MOLT-4 cells was of rapid onset and was characterised by marked redistribution of phosphatidylserine to the outer surface of the plasma membrane and DNA laddering within 160 min, while the mitochondrial transmembrane potential collapsed over roughly the same timescale . The process was associated with proteolytic processing of pro-caspase 8 and Bid, followed by processing of pro-caspase 3. It is noteworthy that the oligodeoxynucleotide CGTTG was a potent inducer of apoptosis in MOLT-4 cells and that the relative activity of different 5-mers correlated with their ability to arrest KYO1 cells in the cell cycle . In the present work we have shown that CGTTG mimicked the antiproliferative effects of the RNase H-active 20-mers in the absence of any antisense activity against c-myc mRNA (Figures 4 and 6). We have also demonstrated that once MOLT-4 cells are rendered resistant to CpG oligodeoxynucleotide-induced apoptosis they no longer undergo programmed cell death or even cell cycle arrest in response to downregulation of c-Myc by a chimeric antisense 20-mer (Figure 6C and 6D). Despite the large body of evidence linking c-myc expression to cell cycle control [6, 7, 9], it would appear that its functions have been superseded by other dominant pathways in the established leukemia cell lines. This raises the question as to whether independence from c-myc was selected for during establishment of immortal cell cultures, or occurred prior to this during malignant progression in vivo. It has generally been assumed that expression of the oncogene would be critical for maintaining the malignant phenotype of leukemic leukocytes since it was shown to be upregulated in these cells [3, 4]. This relies on the logic that if a protein is there and expressed in abundance, then it must be doing something, which is not necessarily true. It may well be that overexpression of c-myc serves to select for cells that are insensitive to its activities, such as induction of apoptosis, and that the accompanying genetic changes contribute to malignant progression without the further requirement for elevated c-Myc protein [8, 9, 25–27]. Our future work will address this question using primary leukemia cells derived from patients before and during therapy. We have shown that use of antisense oligonucleotides in assessing gene function may lead to spurious assignments, if not properly controlled by confirmation through independent strategies. Conflicting results of such an approach prompted this investigation, which has led to the conclusion that expression of c-myc is not critical for cell proliferation in the established leukemia lines studied. Rather the CpG 5-mer motif present in the antisense oligodeoxynucleotide sequence, and not downregulation of c-myc, was responsible for the observed biological activity, leading to apoptosis and cell cycle arrest by a non-antisense mechanism. This is an important finding which needs to be taken into account in defining the true functions of c-myc in dividing cells. It raises the question as to whether expression of the oncogene is required to sustain uncontrolled proliferation in primary malignant cells, and if not, then why is the gene amplified / overexpressed in leukemia and lymphoma. Finally, apart from the importance of avoiding CpG 5-mer motifs in antisense oligodeoxynucleotides, the unusual biological activity of these small oligodeoxynucleotides presents the opportunity to define novel targets for antileukemic drug development. The human T cell leukemia line MOLT-4, the human acute promyelocytic leukemia HL60 and the histiocytic lymphoma line U937 were supplied by the European Collection of Animal Cell Cultures (PHLS Centre for Applied Microbiology and Research, Porton Down, Wiltshire, UK). The chronic myeloid leukemia line KYO1 was donated by the LRF Leukaemia Unit, Hammersmith Hospital (London, UK). Cells were maintained in exponential growth in RPMI 1640 medium supplemented with L-glutamine (GibcoBRL, Paisley, Renfrewshire, UK) and 10% heat-inactivated fetal bovine serum (Harlan Sera-Lab Ltd, Crawley Down, West Sussex, UK). Cell number per ml was determined on a Coulter Counter ZM (Coulter Electronics Ltd, Luton, Bedfordshire, UK). Viable cell number per ml was measured by flow cytometry of cells excluding propidium iodide on an Ortho Cytoron Absolute (Ortho Diagnostic Systems Ltd, High Wycombe, Buckinghamshire, UK). Chimeric methylphosphonodiester / phosphodiester oligodeoxynucleotides were synthesized as described previously  using methylphosphonamidite and phosphoramidite synthons (Glen Research, Sterling, VA; UK supplier Cambio Ltd, Cambridge). 5'-Amino-Modifier C6-TFA (Glen Research) was incorporated in the final cycle of the synthesis and the oligodeoxynucleotides were labelled with fluorescein, postsynthesis, using Fluos reagent (Roche Diagnostics Ltd, Lewes, East Sussex, UK). Oligodeoxynucleotides terminating at their 3' ends with phosphodiester internucleoside linkages were synthesized on DMT-C3-Succinyl-CPG support (Peninsula Laboratories Europe Ltd, St Helens, Merseyside, UK) to provide protection against 3'-exonuclease by a 3-hydroxlypropy phosphate group on the 3'-OH. Fluorescein tagged morpholino oligonucleotide analogues were generously donated by AntiVirals, Inc. (Corvallis, OR). 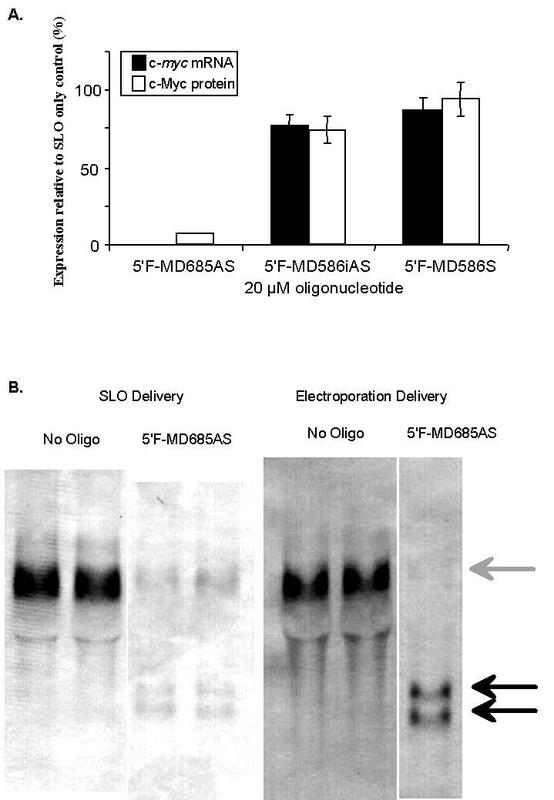 Oligonucleotides were introduced into the cytoplasm of cells by 10 min reversible permeabilization of the plasma membrane with streptolysin O (Sigma-Aldrich Company Ltd, Poole, Dorset, UK) in the presence of external concentrations of 0.002–20 μM oligonucleotide in serum-free RPMI 1640, as previously described . A full experimental protocol for this technique is available at the web site of The Antisense Research Group at The University of Liverpool http://www.liv.ac.uk/~giles. Alternatively, cells were electroporated in the presence of oligonucleotide under the reported conditions . Results presented represent cultures in which >85% of the cells had taken up the oligodeoxynucleotide and subsequently resealed to exclude propidium iodide as determined by dual parameter flow cytometry. Effects on cellular content of mRNAs and protein were determined by densitometry of Northern and Western blots as previously described [13, 18]. Total RNA isolated from KYO1 cells was diluted to a concentration of 1 μg/18 μl reaction volume in complete First Strand Buffer mix (GibcoBRL) containing 0.4 nmol oligodeoxynucleotide and 0.5 U E. coli RNase H (Boehringer Mannheim UK Ltd, Lewes, East Sussex, UK). Reaction mixtures were incubated at 37°C for 30 min. The reaction was terminated by heating at 70°C for 10 min, and first strand cDNA synthesis was carried out using 200 U Superscript II (GibcoBRL) and 60 pmol random 9-mer oligodeoxynucleotide primers according to the manufacturer's instructions. Samples (1 μl) of the reverse transcription reactions were subjected to PCR amplification using an oligodeoxynucleotide corresponding to bases 368–397 of c-myc mRNA (GenBank Accession Number V00568) as the upstream primer (CGGGCACTTTGCACTGGAACTTACAACACC), and the complement of bases 1221–1243 plus a 5' 23 base T7 promoter sequence as the downstream primer (GCGTAATACGACTCACTATAGGGACTCCGTCGAGG AGAGCAGAGAA), to yield a 899 bp product from uncut message. Products were separated by 1.5 % agarose / ethidium bromide (1 μg/ml) gel electrophoresis. This work was supported by the Leukaemia Research Fund of Great Britain.